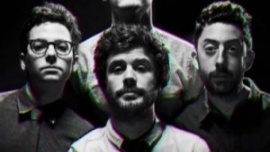 I've decided to go with Passion Pit for this project. They are a fun, upbeat bunch with a unique sound. The colors and design used in other gig posters I have seen of theirs are abstract, play with negative space, and over all have the typographic layout I am drawn to. I have seen them live before and want to can say they are equally talented performers and they are musicians. I have decided to focus on a show that has already happened in The State Theatre in Portland, Maine. The venue instantly captured my attention. I hope to combine the architecture & old school vibe of the theatre where they performed with the bright, new school colors of the band.